He talked through a series of pictures and tables of information with pond and filtration specifications, and after an hour I think the whole club got a sense of how it feels to build a pond. We also kicked off our judge-it-for-yourself competition. The objective is to guess how the judging will go on the top 18 awards at our Garden Show. 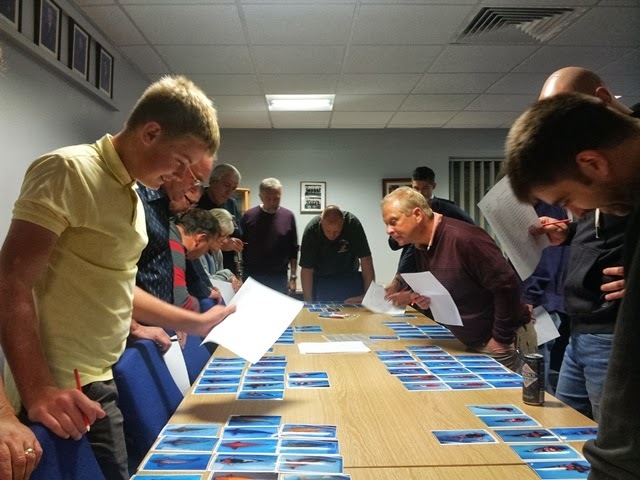 It’s a repeat of last years quiz format – we lay out photos of each koi entered into the show over a couple of tables, grouping them in variety and size order. Then the members walk around the tables, work out which koi they think will win the main overall awards and record the koi’s reference number on their quiz sheets. Gary Pritchard will be judging the actual Garden Show and the winner of the judge-it-for-yourself quiz will be the person who gets most answers the same as Gary’s judging decisions. The great thing about the quiz is that we open it to all members – whether they entered the Garden Show or not. But it’s facilitated by all the members who entered the Garden Show, and who have basically provided the koi subjects that enables us to have the quiz. Next year I hope we’ll have 15 or 16 entrants to the Garden Show, and I expect to cap it at 16 entrants to fit into the time constraint we have of having only 2 days to do the benching. Next month we have Syd Mitchell (aka Manky Sanke) visiting us, and he will be delivered a talk to the members at our usual club venue.